Last weeks global food strikes show young workers get what trade unionism is about - and bringing new forms of digital organisation into play. When I tweeted my congratulations to the fast food workers who took strike action last week, as part of their fight for fair pay and tips, I said they had shown the naysayers that unions are absolutely relevant in today's world of work, not least in the toughest of sectors. I had some interesting, and telling, responses to that. “How was the fast food industry tough?” “How many workers in the sector are union members? Mystery?” and “Minimum qualification requirements mean minimum wage”. My point, perhaps difficult to explain fully in a tweet, was that hospitality is a notoriously difficult area for trade unions to recruit and organise in. As is the precarious, agency, zero-hour and gig economy generally. So to the tweeter who asked, with that note of sarcasm, how many fast food workers are union members, it’s no real mystery. It’s difficult to build a collective mentality amongst any low-paid, transient workforce, especially when the anti-union laws in this country restrict us enormously in our efforts. And when their bosses tell them, illegally, either that they have no right to join a trade union, or they will be sacked if they do. But in any case it’s not so far off to say that working conditions in the industry are amongst the toughest. No they aren’t first responders, nurses or working in social care, but it is low paid, often gruelling work. And hospitality is full of sharp practices, like those of TGI Fridays, taking tips off waiting staff to make up the wages of the kitchen workers. Speaking to members, I know it hasn’t always been like that, but when private equity moved into the sector, the squeeze was well and truly put on the quality of their working lives. Hours are long, kitchens become like furnaces (particularly during our recent heatwave) and customers require outstanding people skills. The idea that taking orders and carrying plates of food is undemanding and deserves to be rewarded only by the minimum wage is, frankly, obscene. But that incredible day of action on 4 October, which saw TGI Fridays, McDonalds and Wetherspoons staff walk out, supported by UberEats, Deliveroo and other couriers, and joined by hospitality workers from four continents, demonstrated that only the trade unions can give any chance for workers, exploited almost as much in 21st century Britain as they were in the 19th, to stand up to their greedy bosses. I have always said that being relevant is the key to the future of our movement, if it is to survive and grow. We have to be relevant to working people’s lives, to the people we want to represent. By looking at new ways of organising in the hospitality industry, Unite, the BFAWU, GMB and others are demonstrating that we can become exactly that. Our TGI members have undoubtedly countered the myth that there’s no point in joining a trade union if the employer doesn’t recognise one. We had about five members there when the campaign against tip robbery started, and there was little organising going on. The fact is that the workers came to us and told us they’d joined Unite and they wanted to go on strike. We put our confidence in those members, in their ability to build membership across the restaurants, and deliver on a strike ballot. We were essentially being told to adapt and learn from this group of young workers, for whom trade unions might appear rigidly bureaucratic, about new ways of mobilising, building awareness and supporting each other. And so we’re seeing that the sector may only be the toughest to organise if unions stick to traditional ways of doing it. By doing it their way, using WhatsApp and other online methods to persuade and support, TGI staff have joined Unite in large numbers, and stood solid together at meetings and on picket lines. But it’s undoubtedly a learning curve, for all of us. As a young worker and shop steward on the Liverpool docks in the late 1960s, I led a campaign for the rate for the job, which we weren’t paid until we were 25, even though we were doing exactly the same work as the older hands. So I organised the younger workers, and even though our claim was resisted by our senior colleagues and management alike, we carried on fighting and eventually won an astonishing 100 per cent rise in our pay. That experience taught me a lot about the nature of solidarity. The hospitality strikers remind me of those times – and why unions are as relevant as ever in giving the faith to fight injustice. They demonstrate too that young workers ‘get’ solidarity. They aren’t the ‘future’ of trade unionism, they are its ‘now’. They know they are being ripped off, and they know that the only way to put an end to that is to be trade unionists. They know that trade unionism is about collectivism, about people understanding that together they are stronger than as individuals. 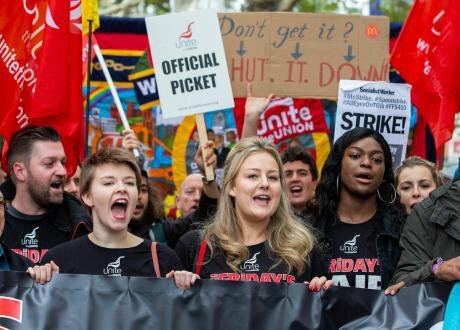 The TGI and McDonalds strikers are in different unions, but they’ve held public meetings together, gone to rallies together and marched in the pouring rain with a joint banner at the front of the TUC’s anti-austerity demonstration last May. And that’s exciting for me, and tells us that our movement has a vibrant future. If we’re talking to young people now, in a so-called ‘gateway industry’, they are far more likely to take their trade unionism with them through their careers. The stand the TGI workers have taken, and their Pizza Express colleagues before them, and of all those involved in our Fair Tips campaign, appears finally to have forced the hand of a government so ideologically wedded to non-intervention. Finally – only 826 days since consulting on the issue – they have bowed to our demands and decided to ban employers taking tips from staff. (Though of course it remains to be seen if Theresa May will really deliver on her promise, given the powerful lobby that has persuaded her to sit on her hands thus far). Amazon workers too are finally to see an increase in the minimum wage. And as Jeremy Corbyn said, they haven’t been gifted the increase by the richest man on the planet. They organised for it, and their fight goes on for better working conditions, and to get the company to pay its taxes. As Chris Hepple, a Wetherspoons worker, said of the fast food strike, “I knew workers had never won better living standards, conditions and power by relying on the generosity of any government or these companies”. A Jeremy Corbyn government is committed to restoring sectoral collective bargaining, meaning that a rate agreed in an industry must be honoured by all employers in it. Labour has highlighted how the hospitality sector desperately needs its workers to have such a voice in setting their own terms and conditions. In contrast, of course, the political establishment has always sought to undermine trade unions. They don’t want trade unionism becoming part of the culture. They don’t want people to recognise that unions are a force for good in our workplaces and in our communities, giving a democratic voice to both working people and people not in work (who Unite have welcomed into our union family through our Community organisation). Our corporate and political elite know that if trade unions again become part of the fabric in which society operates, then more and more people will be attracted to them, there will be more collective strength, and a greater and fairer distribution of wealth – away from the powerful and the wealthy. But as a movement, we are increasingly demonstrating that we are that force for good, bargaining and winning better wages for workers, giving people dignity through a collectivism that a new generation of trade unionists clearly understands far better than those elite would have us believe.